Over the last decade, environmentalists increasingly see that conservation objectives require a connection to the local culture. This is primarily because, at the end of the day, local people not only live in those ecosystems, but have lived in them for literally generations. We would like to think that all environmentalists have moved beyond wielding one's conservation objectives without this cultural sensitivity (or, perhaps worse, cloaking one's conservation objectives behind a veneer of cultural sensitivity). However, too often environmentalists continue to miss the critical importance of authentic connection with community and culture. With our Peruvian partner ACCA (Associacion de la Conservacion de la Cuenca Amazonica), we are exploring ways to fully connect with local communities and cultures, in a 'transcend and include' manner of working towards shared objectives. That is, including the objectives of both communities and NGOs but transcending their exclusivity into a greater wholeâ€”a whole that is greater than the sum of its parts. Much like how two mechanical parts of a clock alone cannot tell time, but, together, they can. So, what does this actually look like in practice? Truly, it can take myriad forms. In September, it took a form that was unprecedented for both community and NGOs. Members of One Sky were made hosts of a three-day festival for la Virgen de Chanka, a revered deity of communities in the Andes of Peru. We were the first foreigners to receive this role. And, we had never ourselves been asked to participate so centrally in such a festival in any of the countries we've worked. It was a unique, unprecedented, and likely singular life-experience for us all. And it was challenging! We found it difficult to explain to our Canadian friends and colleagues why we were supporting a religious ceremonial festival in another village half way across the planet. For a country like Canada, in which most NGOs retain a firmly secular public engagement, that is quite an unusual way to engage in conservation work! Here, we share more on the big picture of why we supported this festival, and also describe some of the endearing details of this festival in Peru. One of the world's most important biodiversity hotspots, where the eastern slopes of the tropical Andes meet the Amazonian lowlands. Tremendous climatic changes occur as the landscape sweeps from snow-capped mountains to the treeless plains and dry valleys of the altiplano before a sudden descent into steep cloud forests and the broad expanse of the low-lying Amazon floodplain. This topographic complexity has resulted in an exceptional array of habitats sustaining a vast number of species. Efforts to conserve this Andean Amazon have had mixed results. ACCA has conserved a large area of land (1,450 acres) and built a research center, called Wayqecha, located at 3,000 meters above sea level. It exists not only for cutting-edge ecological research, but also environmental education. The latter is clearly important, since the nearby communities still let their cattle graze from the slopes above down into the forest itself! Deforestation is always a risk, and since the slopes are so steep and easily eroded, that once the forest is gone,… it is gone. 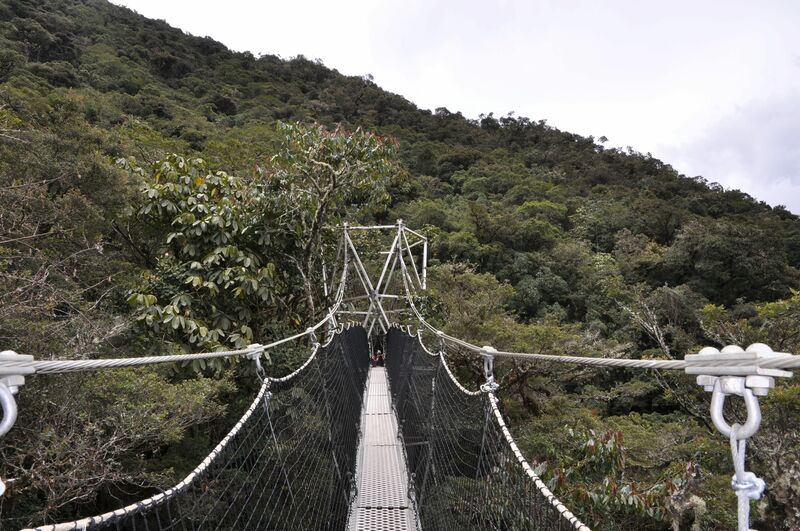 This year, through a shared project with Canadian NGOs One Sky and Drishti and Canadian company Greenheart, ACCA built a canopy walkway through the cloud forest. This aligns with their objectives of research, conservation, and education as well as offers a way to generate income for communities through their involvement as guides and interpreters. At the outset of this project, we went to the surrounding communities to explain the intention and to generate interest in the guide-training program. Initially, we were greeted with bewildered looks. The open-mouthed response was, 'you want to build whaaat? A bridge in the trees?!' The cross-cultural gap was very evident: while local people were just trying to make ends meet, these environmentalists were wanting to build what amounted to them as a crazy structure more appropriate to monkeys than humans! At some point, however, someone mentioned that we were the hosts of the festival for La Virgen de Chanka that year. Almost immediately, there was an increase in their interest and commitment in the canopy walkway project, not really because of the project itself, but rather because of our evident commitment in their life and culture. A four-month guide-training program ensued, with 6 women and 6 men from the local communities of Suchabamba and Challabamba. It included skills-training on walkway construction and maintenance, as well as sought to develop some subjective capacities required in becoming a guide, such as strengthening self-esteem and affirming cultural identity. Panning out from these details, what we find are two groups with two sets of objectives and perspectives, attempting to work together. Environmental NGOs have an objective to conserve an extraordinary cloud forest ecosystem, attempting to connect to local communities whose objectives are to address poverty and to support local livelihoods. 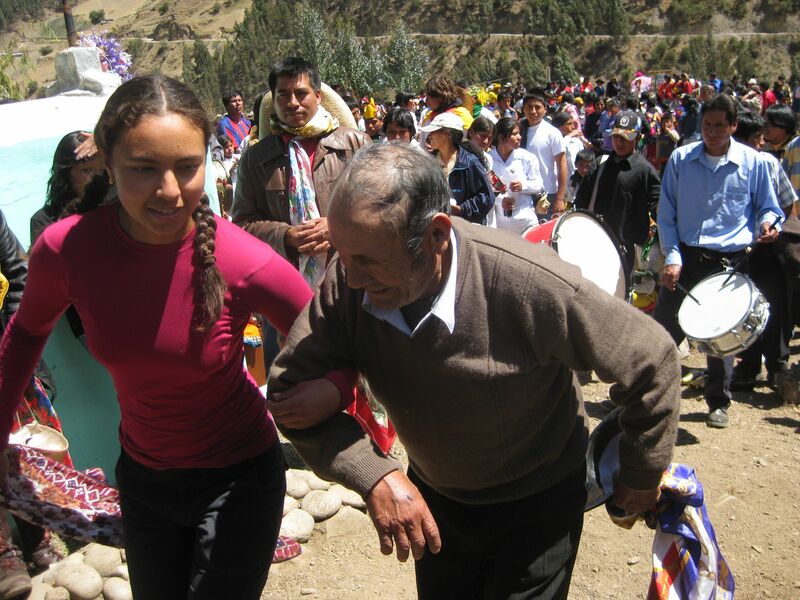 NGOs are often operating with a secular worldview whereas Peruvian communities tend toward a religious worldview. What kind of an approach could make sufficient room for these different objectives and perspectives? And, what could become possible as both are transcended and included? One of the most amazing things about honoring another culture and worldview is that it is not possible without shifting your identification with your own. That is, if I am rigidly identified as a secular, Canadian environmentalist, then I won't be able to authentically and fully honour the Peruvian culture and worldview. Releasing the exclusivity on your own cultural identity does not mean it disappears, rather it becomes more spacious to include others' lives, expressions and beliefs. Had we held tightly to our identifications, we probably would have declined this role as host of the Virgen de Chanka festival. We likely would have said, No, I can't accept this since I am not Catholic, I don't live in Peru, I am spiritual but not religious, etc. Or, we might have said, “No, I am here to work for conservation only, not to support communities.” Instead, we said, yes, allowing room for both secular worldviews as well as the religious ones, for both conservation objectives and community objectives, curious to see what new emergent would come from uniting these. The alluring, ever-present question is: If two parts of a clock can come together to create time, could our perspectives come together to create a sustainable world? What has emerged so far is a conservation project that is intimately tied to local community development. ACCA could have easily built a canopy walkway that was completely disconnected from the surrounding communities, a project aimed to raise money for the NGO itself. Instead, this canopy walkway has community people as guides and will become an income-generating alternative for those communities. This is a quality of conservation that is enabled by trust between both entities and is surely enriched through collaboration. The Virgen de Chanka festival was a good illustration of what this trust and collaboration looks like, this year and moving forward. Over the year, we collected donations for the festival. For each donation, we added a bead on a string, until we had a full rosary. This idea was originally from Buddhist social-action whereby a mala is created of donations for a social cause. To align with the Peruvian context, we adapted this from mala to rosary (both of which are essentially prayer beads, one from the East and the other from the West). We returned to Peru with this rosary of all the North American donations that contributed to their uniquely Latin American festival. When we presented this at the festival, the gently spoken two-word response was 'que bonita. How beautiful. The festival consisted of dancing, music, feasting and drinking--all in honour of their most blessed goddess figure. It reminded us of community celebrations elsewhere, such as a First Nation's potlatch, with pervasive generosity and a sentiment of collectivism. Everyone who entered the house received a generous meal, drinks, and dancing. Over the three days, we fed close to 400 people and danced with most of them! One of the most inspiring moments was when an 84-year old man danced the marinara folkdance with a young 21-year old, the span of more than 60 years between them evaporating with each step, each flick of the wrist, each swing of the hip. This spoke to resilience in the face of hardship, as well as showed us the energy accessed by this old man through the traditional dance itself. 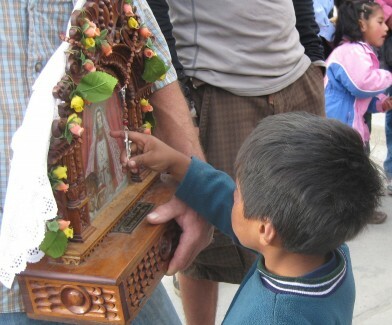 Another sweet moment was when a young Quechua child became fascinated with the rosary draped over the icon of the Virgen de Chanka. As he softly touched the beads, I felt the metaphorical connection with all those who had touched him via donating to this festival. I couldn't help but also wonder when his school class would visit the canopy walkway, and whether one day he would become an ambassador of the cloud forest ecosystem, a proud contributor to its conservation. To everyone who donated to this Festival and to the larger sustainable development goals, we extend gratitude and appreciation.